Traditional afternoon tea has long been the epitome of British hospitality. Introduced in England in the year 1840 by the seventh Duchess of Bedford who would find herself ravenous during the long period between lunch and dinner which was served fashionably late at eight o’clock. Once she began sharing her new habit with high-society friends, it progressed into a daily event of the English aristocracy. With the 1920s marking the height of the afternoon tea craze, guests would be treated to the finest teas, elegant tableware and live musicians. In fact, Dukes London has been serving afternoon tea in its legendary drawing room since 1908. Today, the tradition is not just for the brits, but has transcended the world over. 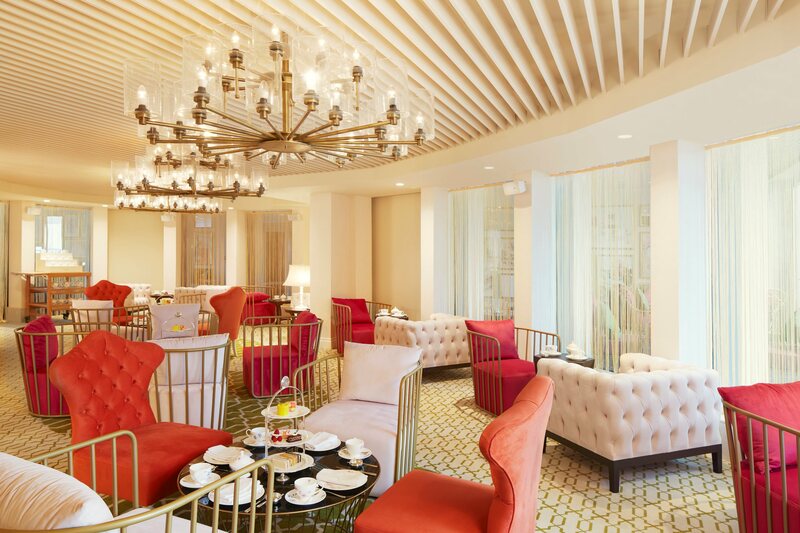 Dukes Dubai, the UAE based sister hotel to Dukes London, has recently launched its new afternoon tea in the aptly named The Tea Lounge, located on the third floor of the hotel, designed with the well-healed residents and visitors of this cosmopolitan emirate. The Tea Lounge is a charming space, split into two distinct areas; a fabulously feminine room with plush upholstered sofas in shades of a sugar-coated rainbow and a light and airy terrace room with access to a tiny balcony that offers spectacular views out towards the Dubai Marina skyline. The latter is also awash with colour, a vivid clash of fuschia pink and grass green cushions adorn the unique gold iron armchairs that dot the room. Artworks and mirrors scatter the wall, a nod to Dukes teatime traditions. The traditional time to ‘take tea’ is between three and five o’clock, however, The Tea Lounge begins serving their offering from midday. You’re presented with two options for your afternoon tea experience; the London Tea (AED 170pp), complete with a choice of tea from the sommerlier’s trolley or the Palm Tea (AED 320pp) option which comes with a glass of bubbles. There is a gourmet selection of loose leaf teas to choose from the more widely drank Royal Breakfast and Earl Gray Flora to unique blends such as Emirates Spice and Masala Chai. My personal favourite is Royal Darjeeling which originates from the up-country estates of north India on the steep slope of the Himalayas. With a characteristic delicate taste and subtle floral aromas, this light amber cup is both invigorating and comforting and is highly recommended for those that want to try something new but aren’t confident being overly adventurous. The tea is courtesy of international designer tea brand Tchaba which is a favourite among avid tea drinkers (like me). Alongside your tea and served on a cute chrome cake stand is a mouthwatering selection of finger sandwiches, assorted pastries and freshly baked scones with preserves. Crustless finger sandwiches consist of light egg mayonnaise, hearty Montgomery’s cheddar cheese & pickle, Roast beef & creamed horseradish, Scottish smoked salmon & dill and of course, Cucumber & cream cheese. The pastries (which consist of mini versions of your favourite cakes) conjure up emotions of both nostalgia and excitement. Having finally found Battenberg in Dubai (it has been a three-year search! ), I rather ungracefully demolished the beautiful marzipan edged Battenberg slice before setting my sights on the Lemon meringue tart, chocolate & candied orange slice, mango & lime swiss roll and the Scottish raspberry shortbread. Afternoon tea is completed with a selection of plain and raisin scones served with homemade preserves and Cornish clotted cream. Whilst the tea itself sounds delicious, the experience is further accentuated by the beautiful chinaware that is served upon. Custom designed for the Tea Lounge by renowned British brand William Edwards, it’s delicate pastel florals evoke a feeling of yesteryear without being in the slightest bit chintzy. This is afternoon tea at its most instagrammable.